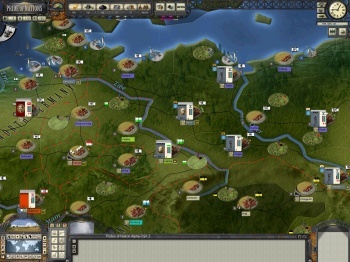 If colonialism is what revs your engines, then the Victorian era strategy game Pride of Nations from veteran studio AGEOD should be at the top of your watch list. Here, you can play as any one of eight nations (USA, Great Britain, Germany, France, Japan, Russia, Austria-Hungary, and Italy) and carve out your global presence between 1850 and 1920. Upon sitting down for the demonstration, the first thing that poppped out about Pride of Nations is its excellently designed user interface that immediately transports you to the era of water wheels, railroads and rifles. As your nation explores the untamed wilderness of, say, Africa or India, you must send out expeditions with specific goals in mind like finding resources or just plain mapping the jungle. Diplomacy is handled with an incredibly detailed system, and not just with other powers but also the natives that you might meet and barter with in new territories. Once you set up a colony, you will also want to build trading posts and other buildings to send resources back to your home country. Prestige is important, so you will want to also send out geographical expeditions to map natural wonders. "It's very prestigious for a nation to say that I am the first to discover the source of the Nile, for example," said Philippe Thibaut from Paradox France (aka AGEOD.) I can't say for sure how all that will combine into a fun game, but the UI and the subject matter make me excited to delve into the economic model and diplomatic challenges when Pride of Nations comes out this summer. Salem is an ambitious free-to-play MMO set in a New England where crafting and community takes a focus over combat. Oh, and once you die, you die. Check out my full preview here. 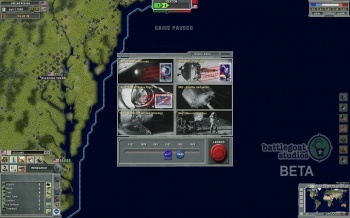 Riding on the success of BattleGoat Studio's Supreme Ruler 2010 & 2020 comes a game that simulates the building tension of the Cold War between the U.S. and U.S.S.R. from 1945 to the 1990s. In contrast to many strategy games, if the tensions rise too high and open war occurs, then you lose the game. The secret is to increase your nation's sphere of influence though diplomacy, espionage and fighting proxy skirmish wars like the Korean War or Vietnam. Real world goals like putting a man on the Moon will increase your global influence and help you win the Cold War. The first choice in Supreme Ruler: Cold War is whether you will play as NATO or the Warsaw Pact. The map interface is a bit cluttered and stilted, until you zoom out and realize that the game is built using satellite images obtained from NASA. On a tactical level, you will be able to control tanks, aircraft and infantry in the proxy wars, being careful not to attract too much attention or even capture too much territory lest the DefCon level reach 5. It's an interesting concept for a strategy game, balancing aggression with the danger of open war, and I was interested in how real life events would be represented. For example, the Olympics were often used as prestige-building events by both the US and USSR, and Daxon Flynn from BattleGoat Studios assured me that they were figuring out how to include the results of athletic games in Supreme Ruler: Cold War. Now, if only we could relive the US hockey team beating USSR in 1980 over and over again (except without Kurt Russell), I'd be a happy man.